Rose Grove was a major centre in the East Lancs rail network, receiving large numbers of coal trains from Yorkshire which were then distributed to power stations in Lancashire. And then on Summer Saturdays there was a continuous procession of excursion trains carrying Yorksire day trippers to the Lancashire coast - mainly Blackpool - but Southport and Morecambe could also be reached from here. Tom Wray's L&YR Chronology records: "The L&YR announce tenders for works required in the removal of excavation for marshalling sidings on both sides of the railway, re-arrangement of goods yard, construction of the bridges, retaining and platform walls and the foundations for engine shed, etc., at Rose Grove." (Manchester Guardian, 5 June 1897). Subsequently: Tender of Holme & King, £65,843-10-11d, to be accepted for removal of excavation for marshalling sidings on both sides of the railway, re-arrangement of goods yard, construction of bridges, retaining and platform walls, foundations for engine shed, etc., and loading mound at Rose Grove. (L&YR Minutes 30 June 1897). Finally: The L&YR invited tenders for the erection of new engine shed, offices, coal stage, engine turntable foundations, pits, etc., at Rose Grove. (Manchester Guardian, 7 May 1898). In the L&YR Minutes dated 6 December 1898 it was noted that Holme & King were to carry out the foundations at Rose Grove at their schedule of prices for the engine shed foundations there. The L&YR subsequently invited tenders for the erection of platform roofing and station buildings at Rose Grove, according to the Manchester Guardian of 9 February 1899. The Manchester Guardian of 7 October 1899 recorded L&YR inviting tenders for the erection of new warehouse, offices, closets, etc., at Rose Grove. The famous Grids and engine shed were completed early in the new year, according to Railway News of 3 February 1900, with the passenger station completed by August 1900. The LMS announced the modernisation of the engine shed in early 1936. Rose Grove was slated for closure on 6 May 1968, according to the December 1967 issue of Railway Magazine, but the shed was still open in August 1968 to receive back the last Copy Pit banker from Stansfield Hall on 3 August 1968. The well equipped Motive Power Depot at Rose Grove survived to the very end of steam on British Rail. 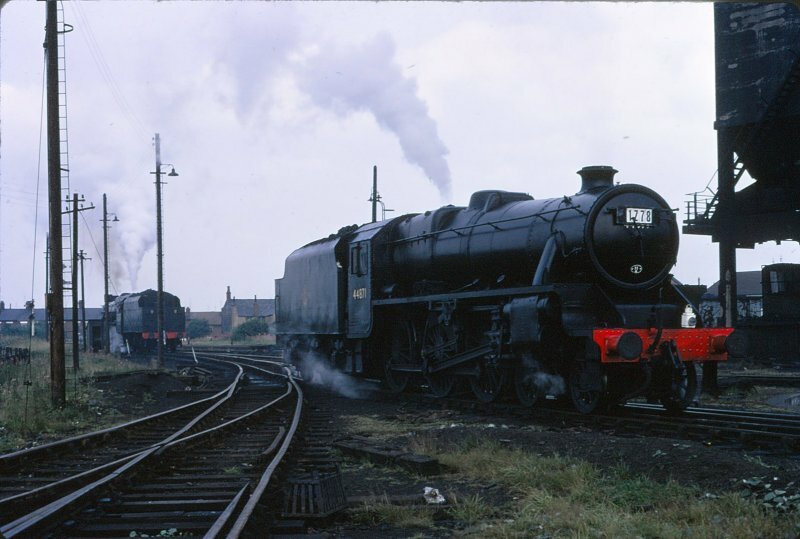 The image below shows Black 5s 44871 and 44894 being readied for excursion duties on the 4 August 1968. At this juncture the banking of trains over Copy Pit from Stansfield Hall - a duty latterly covered by Rose Grove - had finished the previous day. 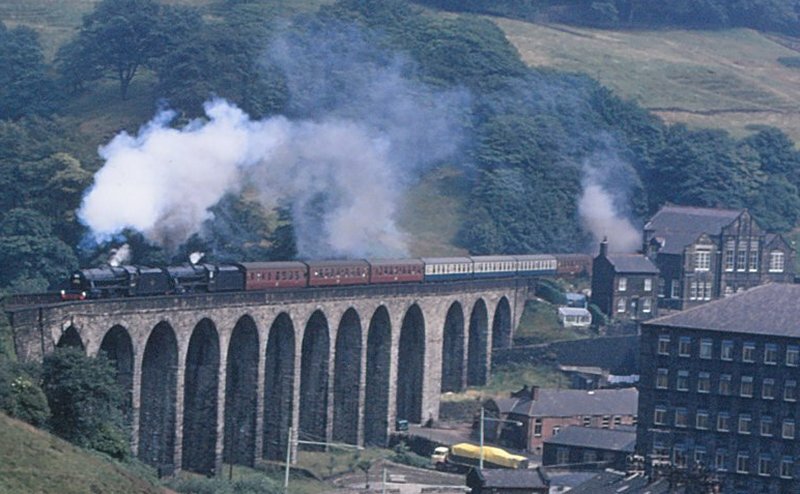 Later in the day 44871 and 44894 were snapped heading back towards Rose Grove as they crossed Lydgate Viaduct, having just exited Kitson Wood Tunnel. Note that even at this date, the first carriage in the train is of LMS build. Another well-known Rose Grove veteran was Stanier 8F 48773, which not only powered mainly of the final specials, but made it into reservation and is now domiciled on the Severn Valley Railway at Bridgnorth. 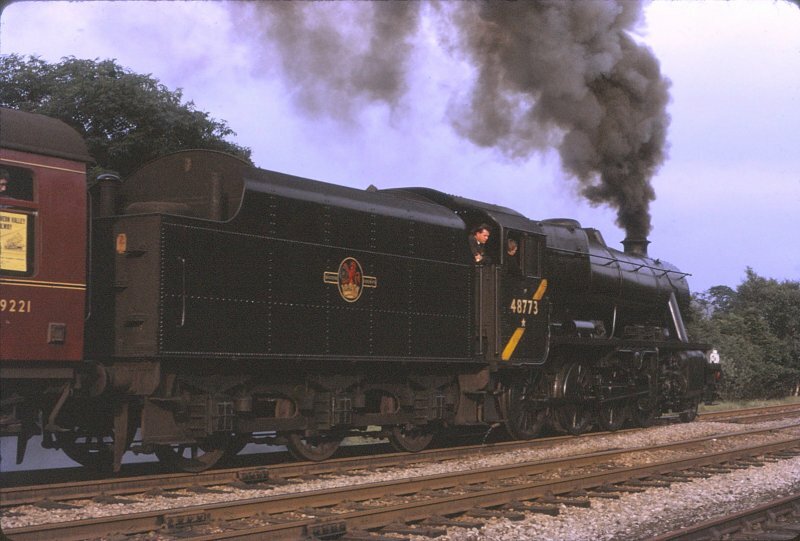 This shot shows 48773 powering one of the last day specials. This image has nothing to do with Rose Grove, but is included as it records an interesting interlude in the run down of steam. Britannia Pacific 70004 'William Shakespeare' had been displayed on the South Bank in exhibition finish on completion, but latterly was just another care-worn Britannia which was withdrawn from Carlisle Kingmoor on 31 December 1967. This was the last Brit I saw in 'proper' revenue earning service, being seen at Southport having brought in a Christmas parcels train on 4 December 1967. However before then she was called to work a special on the Southern Region, and was cleaned up by her then shed, Stockport Edgerley for the working. She worked light to Salisbury for servicing, before running tender first to Westbury to pick-up her train. A curious aspect of this was that the cab sides where lined in black but without the narrow orange lines top and bottom. 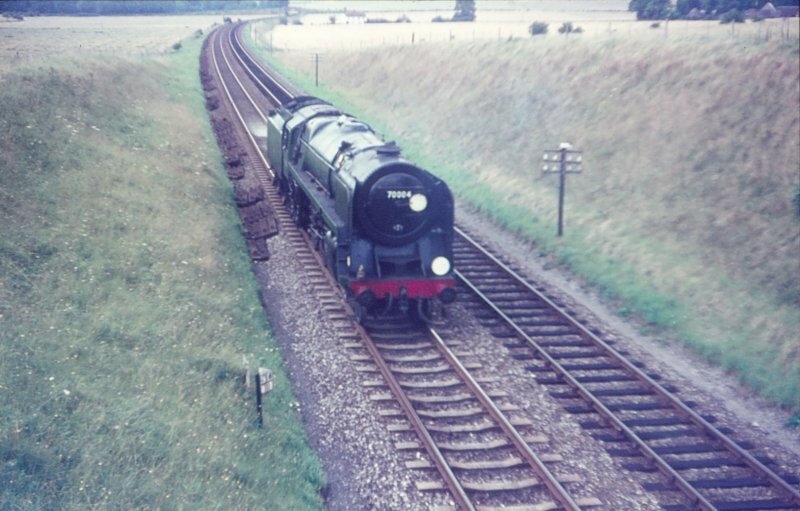 The image below shows 70004 approaching Westbury on 14 August 1966.